Of course, NS10’s can only be bought used or 2nd hand. This means that the obvious place to buy them is eBay, or your favorite alternative (Craigslist for local deals, Amazon has some too, but seems kinda expensive). The main problems with buying NS10's, or parts, is: i) confusion between models, and ii) incorrect advertising by sellers. This page is intended to clarify both those things. Please note that I’m not affiliated with any of the sellers mentioned here, so I’m not intentionally bagging or promoting anyone – just trying to clarify things for buyers. NS-10MX, NS-10MT, NS10 replacement parts. These are the most common, the oldest, and the cheapest NS10's. Anything in full working condition under $400 is a bargain. Anything over $500 should be in excellent condition. The biggest problem with these is that people mix them up with NS-10M STUDIO models, and pay more than they’re worth. The STUDIO model (1987) is a newer and superior model which is worth more than the original NS-10M (1978). It’s actually very easy to tell the two apart. i) The STUDIO model is horizontal, the original is vertical. ii) The studio model also has “NS-10M STUDIO” written clearly on the front. 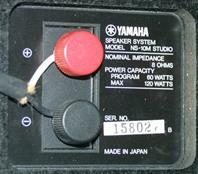 The original has “MODEL NS-10M” written clearly under the large “YAMAHA” text on the front. If it doesn’t have “STUDIO” written on the front, then it is not the 1987 upgraded studio model. iii) Also, the tweeters are noticeably different, and the STUDIO model’s tweeter cover protrudes sharply. iv) On the back, the original NS-10M has a large white paper sheet, detailing the specifications, the STUDIO doesn’t. v) The original version has the old terminals while the STUDIO has the newer terminal plugs. Check the gallery for pictures of all these differences. To compound this common confusion, sellers often, knowingly or not, label their products incorrectly. For example, this seller has lots of the older, original NS-10M’s for sale, but labels them as “NS-10M Studio Monitors” and asks over $800 for them. Technically, he/she may be right in that the original NS-10M was used in studios, however, the vertical NS-10M’s he’s selling are not studio models and are not worth what he is asking. The problem is not limited to this seller, and and a lot of other people do the same. When you read or hear bad things about NS10’s, these original 1978 models are the ones people are talking about. The tweeters are harsh and have a tendency to break if not used properly. Also the bass extension is quite poor (85Hz) compared to the later models. The wattage is less than half of the later models too. And of course, being the first models made, the parts on these original NS-10M’s are all older than the parts on the later models. Beware of these things when you’re choosing a model. BARGAINS: There are some ebay sellers who sell these directly from Japan. Even with the $200 shipping, they seem to be the best deals. And if you can negotiate on shipping, you might get them for an even better price. These seem to be the 2nd most common NS10’s regularly available, and their price varies greatly. They are an upgrade on the original NS-10M model, and came out 9 years after it. See the specs page and the NS-10M STUDIO page for details. As mentioned above, be careful not to confuse these with the original NS-10M’s from 1978. They are very distinct, but sellers often don’t know what they’re talking about, or intentionally mislead, when they advertise them. BARGAINS: Keep an eye out for equivalent or better models, which sometimes sell for less or the same price as the STUDIO. The NS-10MC and NS-10M PRO models are virtually the same as the NS-10M STUDIO. The MC is arguably better, in that it has the ability to be mounted. I have seen the MC sell for under $600 on eBay, which is quite a bargain, and cheaper than a lot of STUDIO models sell for. The NS-10MX is an upgrade of the STUDIO/ PRO/ MC models. As I write this, there is a set available on eBay for under $800, which again, is as much as the STUDIO models sometimes sell for, and the MX is a superior and newer model. These two models are almost the same as the STUDIO model, but seem to be a lot less common. The MC, like the STUDIO, sits horizontally, while the PRO stands vertical, making it similar in appearance to the original NS-10M. This was the final NS10 made solely for studio use. It is an upgrade of the PRO/STUDIO/MC models in that the speakers are magnetically shielded. It is very rare outside of Japan. The magnetic shielding makes these speakers a bit heavier than the previous versions, which means shipping will cost more – particularly from overseas. BARGAINS: The NS-10MX came out six years after the PRO/STUDIO/MC models, and 15 years after the original NS-10M, meaning it has much younger components than these other models. Unfortunately, though, MX’s don’t come up for sale often. At the time of writing, there is a pair on ebay for $750 and I would be tempted to buy them myself if I didn’t already have a pair. These are amazing speakers. These speakers were intended for home theater and/or studio use, and came out in 1996. They are the most distinct of the NS10’s, with their bass reflex port and centered tweeter. Bass reflex ports typically sacrifice clarity for low end strength. This is less noticable with the NS-10MT’s lightweight white cone, but it needs to be taken into consideration when buying. Also, these speakers are magnetically shielded, which makes them heavier and a bit more costly to ship. BARGAINS:The NS-10MT’s go louder and lower than any of the other NS10’s. They are ideal for budget studios who can only afford one set of speakers, or for the hobbiest who might combine their reference monitors with their home hi-fi. 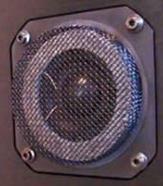 TWEETERS: The original NS-10M from 1978 uses the JA0518 (JA051801) tweeter whose grill cover is quite flat. 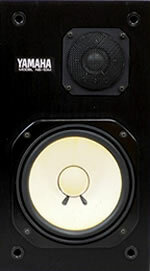 The 1987 NS-10MC, PRO and STUDIO models take the JA0518A (XC712AA0 or XC712AA1) whose grill pokes out sharply, because of the padding added to subdue the high frequencies. The JA0518’s seem to sell for between $60-100, depending on condition, while the JA0518A’s seem to go for $100-120. Both can be bought “new” (it seems Yamaha kept a lot in stock) or used. Some are made in Japan, some in Malaysia. I’m not sure if there is a difference in quality – the prices seem to be the same. All these sellers (1, 2, 3, 4) are advertising their tweeters incorrectly, at the time of this writing. Check the specs and picture gallery pages to make sure you’re buying the correct replacement tweeter for your particular monitor. BASS DRIVER / WOOFER: The distinctive white cone woofer is a bit harder to pin down. There are two types, and as with the tweeters, each type has two names. The JA1801 (JA180100) was from the original 1978 model, but also seems to be usable in the in the 1987 PRO version at least, as this label would indicate. The JA1801A (XN542AA1) is advertised as being for the 1987 STUDIO version. I would assume that means that it is also OK for the NS-10MC too, which is virtually the same as the STUDIO. I have also read on Japanese forums, that both the JA1801 and JA1801A versions are actually interchangeable between all NS10’s. If you have any confirmable information on this matter, please contact me and I’ll post it. The JA1801’s sell between $80-140, depending on condition. The JA1801A’s are less common, and sell for about $240 with shipping. I am not 100% sure what justifies the price difference between the two. 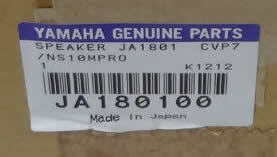 However, the JA1801’s come with a “note” from Yamaha warning that they have been in storage for a long time. The JA1801A’s appear to not contain this message. That leads me to think that the latter is a newer version of the same woofer. If you can confirm this, or have any other info, please let me know. As mentioned, the “new” JA1801’s come with a note from Yamaha warning that they have been in storage for a long time, and that they may have been cosmetically touched up during that time. They also mention that this has no effect on the sound quality.